It's 1942, and the luxurious Palm Beach Royale Hotel is under siege as two of Hollywood's biggest divas vie for the same suite. Mistaken identities, overblown egos, double entendres, and one pampered little lap dog round out this fall-down-laughing riot of a comedy. An all-out love note to those wonderful farces of the 30's and 40's. 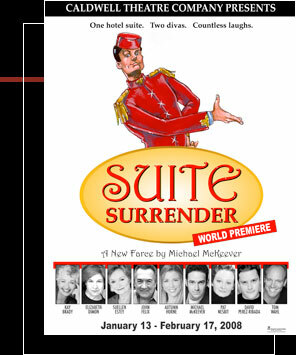 "Suite Surrender is pure enjoyment." 2008 Palm Beach ArtsPaper "Best of 2008 Theatre"
for production photographs, please go to gallery. for the published script, please go to playscripts.com.